1) Bone Soup, the classic retelling of Stone Soup, is both clever and creepy, as Finnigin the skeleton convinces other frightful creatures to contribute to this deliciously disgusting concoction. 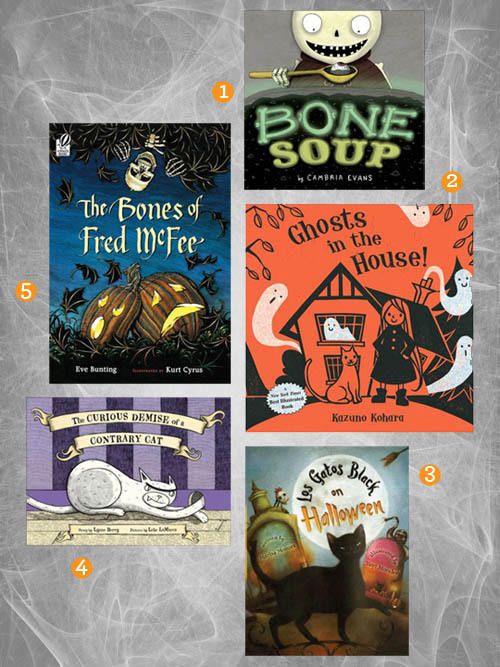 2) Ghosts in the House is a perfect Halloween book for the littlest readers. The illustrations are gentle and charming, and I’m especially drawn to this resourceful little girl who smartly solves the ghost problem in her house without batting an eye. 3) The illustrations in Los Gatos Black on Halloween are beautifully creepy and capture a sense of other-worldliness in a beautiful way. Written in tight, rhythmic verse, the Spanish words throughout the book are easy to understand if you don’t know Spanish, and add depth and richness to this story. 5) The Bones of Fred McFee is great for kids who are ready to embrace something (just a little) creepy. In this mystery, it’s not exactly clear what happens to the toy skeleton that used to hang in the sycamore tree, leaving the door open for the kind of haunting speculation that is at the heart of Halloween. 6) Help your kids create their own Halloween masterpieces with How to Draw a Happy Witch and 99 Things That Go Bump in the Night. Simple and thorough instructions for drawing all kinds of darling creepy things are scattered throughout this story of Little Man, the cat. 7) Bedtime for Monsters is a light-hearted look at the potentially serious problem of monsters at bedtime. With silly illustrations, it’s a fun and funny take on what a monster might do if he came to your house. 8) Frankenstein Makes a Sandwich is best for older readers who will understand its many puns and parodies. Full of laugh out loud jokes and the funniest illustrations, this collection of Halloween vignettes is comic genius! 9) Several creatures return the kindness a friendly witch has shown them in Room on the Broom. This Halloween story is also a sweet look at friendship and loyalty. 10) Narrated by Bram, the Pire family’s youngest son, Dear Vampa, is the lament of a misunderstood vampire family. The book highlights lots of fun differences between the Pire’s and their new neighbors, the Wolfsons, the seemingly normal family who turns out to have a skeleton or two in their own closets. One of my favorite things about books is the information they give us, over and over again. And when they take the fear out of a spooky subject like Halloween? That’s my most favorite. I hope you found a new must-read for your own haunted house! P.S. 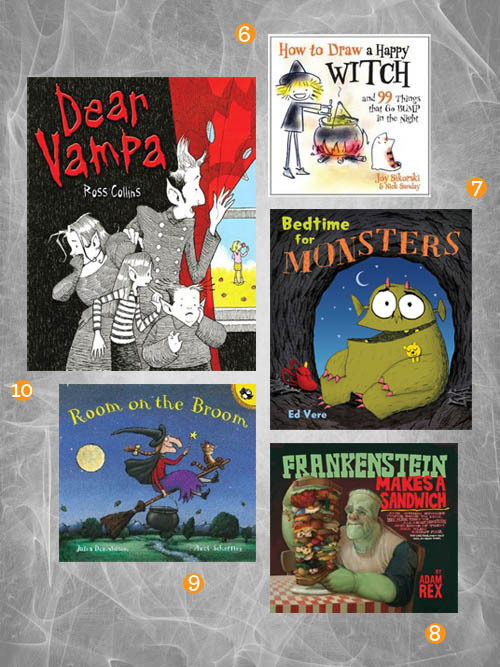 — More Halloween books to love here and here. Our favorite didn’t make the list, but it’s a fun story anyway. “Fright Night Flight” We’ve told it so often that we all have it memorized and have gone through 2 copies of it. Oh. And doing monster voices is a must. I love having books that the whole family knows by heart. So fun! Great list! Going to check out a few of these–thanks! I love Halloween books. One of my favorites is the Bearenstein Bears & the Spooky Tree. Children’s books bring out the best of Halloween, I think. I have my copy of that book from childhood and it’s a favorite in my house too. I’m glad to see others still enjoying it. Love Bone Soup! Finnigan would make an adorable halloween costume for a little boy or girl. SUCH an adorable costume! Someone get right on that! I don’t think I have read any of these before. Thanks for the list! “Boris and Bella” is also an awesome book. It tells the story of two enemies who find common ground at a Halloween dance with delightful rhymes. I echo Molly’s ‘Vanishing Pumpkin’ suggestion — it’s illustrated by the great Tomie de Paola! I can’t wait to hit the library and see if they have any of these on the shelves. They are all new to me, so I’m excited to introduce them to my kids. Love these book posts, Amy! And don’t forget FRANK WAS A MONSTER WHO WANTED TO DANCE! Such a fun and funny book. Yes! That’s another home run! I have noticed a real trend in Halloween books where the characters dance or end up dancing. Maybe that’s the ultimate way to make them friendly and turn our ideas of scary on their heads? Thanks for linking to my list of Halloween & fall books. What a great list you have here! “Big Pumpkin” by Erica Silverman is a true favorite here. There is even a recording of the book on youtube (when it beeps you turn the page). My kids are mesmerized! Halloween is my favorite holiday and most of these are new to me, so I’m excited to check them out! Thanks, Amy! What great ideas! I’ll have to take my six year old to the library and see if we can find some of them. I love these book lists, keep ’em coming! Thanks for the suggestions! One of our favorites is Room on the Broom. We read it all year long. Thanks for these new suggestions for our library. You might also like Hallowilloween it’s a cute book of poems about Halloween monsters. My daughter, Milla, picked it out last year and likes it so much that we read it year round. Love this list, lots of them are new to me. Thanks! These are all new to me. My 16 month old daughter will appreciate Halloween a little more this year than last year. My husband and I are getting more into it. like which often. Bookkeeping may be my profession for a little time. the actual will never move.